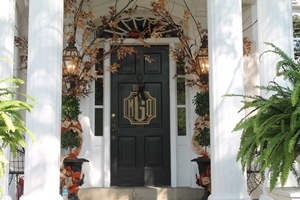 Description: The fabulous metal monograms are the a great way to adorn your front door or inside on a wall. Available in 20 inch square. All monograms come powder coated black but can be easily spray painted the color of your choice to match your house or room. They come easy to hang with your own ribbon or chain. Perfect for your own door or great for a housewarming or wedding gift. If using a monogram for a couple, the left letter is the woman's name first initial, the middle the last name and the right letter the man's name first initial. Approximate dimensions: 20" x 20" (w x l).